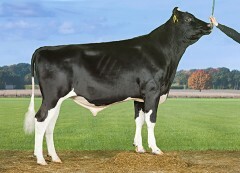 VH River the #1 NTM bull in Scandinavia! The new #1 NTM bull in the breed is VH River, a Reflecton son with +37 NTM! Followed by VH Badger with +35 NTM, VH Barista +35 NTM, VH Baylor +35 NTM and VH Brook with also +35 NTM. The highest Danish Red NTM bull is VR Thiago with +33 NTM, with right behind her VR Guidett with +30 NTM. In the polled index VH Monty P stands out with +33 NTM!